Christopher Priest takes the Black Panther in a whole different direction! With T'Challa gone, who will inherit the mantle? Could it be...the guy with the trench coat and guns? Kevin "Kasper" Cole is out for revenge against the people who hurt his family, and his quest will bring him into conflict with corrupt cops and a brutal hunter. It's the all-new Black Panther vs. the White Wolf as a crime novel in comic form begins - but nothing in a Priest tale is ever black and white. This gritty, street-level Panther saga will conclude with revelations about the fate of T'Challa - and set up Cole to join a whole new Crew! But can Cole, War Machine, Junta and Josiah X handle Big Trouble in Little Mogadishu? 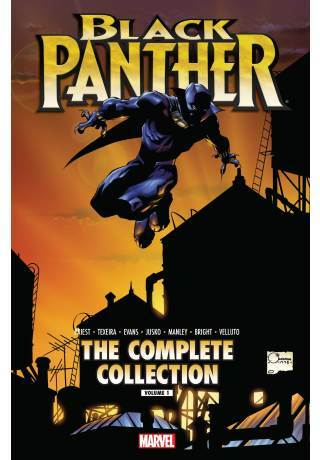 Collecting BLACK PANTHER (1998) #50-56 and #59-62, and THE CREW #1-7.